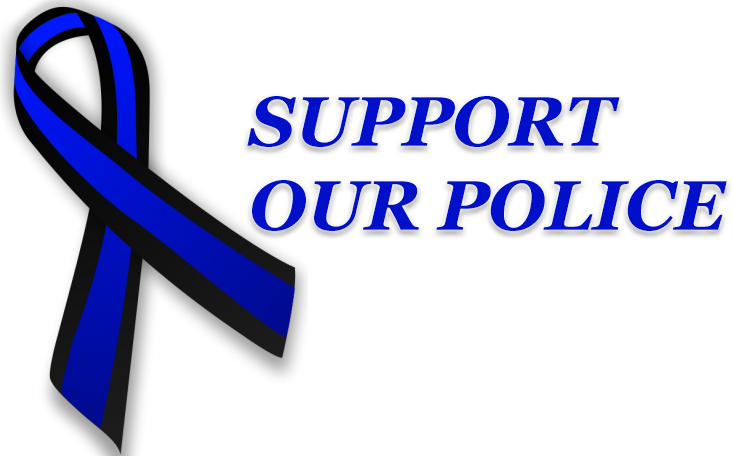 This week is National Police Week. Beginning in 1962, President Kennedy proclaimed May 15 as National Police Memorial Day and the calendar week in which May 15 falls – National Police Week. It’s dedicated to honor those officers that have fallen in the line of duty and to remind us what hard and dangerous work law enforcement professionals are facing every day while serving their communities. This year 30,000-40,000 people are expected to attend the National Law Enforcement Memorial in Washington DC. (The complete schedule of events is here: http://www.nleomf.org/programs/policeweek/). So let’s not forget about the sacrifices these courageous people make for us. Last year, 129 officers died in the line of duty, according to the National Law Enforcement Officers Memorial Fund data (http://www.nleomf.org/facts/officer-fatalities-data/causes.html). Although that’s down 19% from 2016, we are still losing far too many of our brave men and women in blue. As of Monday, 53 officers have died in the line of duty across the country this year, an enormous loss for the American nation. As an Emergency Notification Services vendor we recognize that the main concern of law enforcement professionals is the community they serve, which is an interest we share, since we are privileged to serve many of those communities. 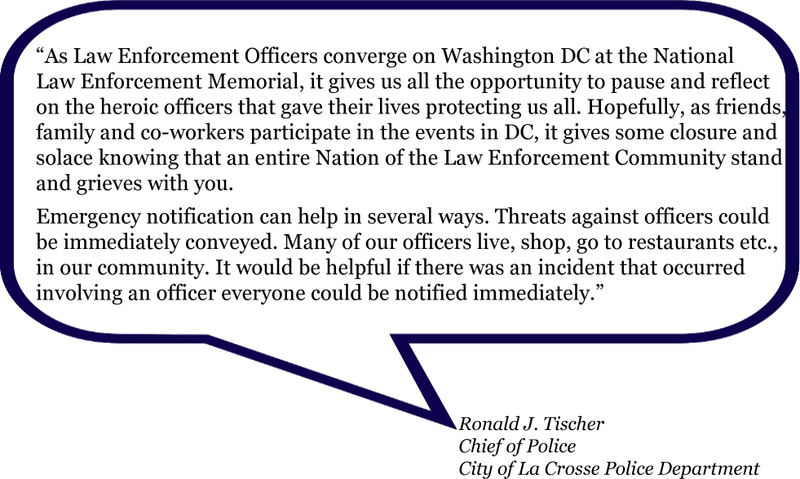 In keeping with National Police Week, we asked some of America’s finest to share their thoughts about National Law Enforcement Memorial taking place this week in Washington D.C. and about ways that Emergency Notification might be used to help protect the lives of their officers. We very much appreciate the comments above. Losing an officer is a tragic loss, not only to their family and colleagues but also to the community they served. To the extent that emergency notifications may help officers to avoid or decrease danger by spreading the word quickly among colleagues and community, we are glad to offer that service. In conclusion, we’d like to express our deep gratitude to the members of law enforcement who daily put their lives on the line to protect and to serve their communities and uphold the fabric of society which makes up our great nation. We appreciate your courage and your commitment, we thank you for your willingness to serve and the sacrifices you make. We share your sorrow and deep sense of loss for your fallen. Thank you! P.S: We’d like to continue this conversation and expand on this article. So if you have other thoughts about the memorial, the sacrifice of fallen officers and the risks you face every day serving your communities, please share those with us. And we’d love to hear your thoughts about how emergency notification services can help you both serve your communities and minimize and respond to the dangers you face. If you’d like to share those thoughts, please drop us a line here.